Sanders, who spoke at Liberty University’s weekly convocation—which students are required to attend—began by admitting that he had differences with the university. Sanders’ speech mostly focused on poverty and income inequality—noting the differences between the rich and the working class. “There is no justice, and I want you to hear this clearly, when the top one-tenth of 1 percent—not 1 percent, the top one-tenth of 1 percent—today in America owns almost as much wealth as the bottom 90 percent. And in your hearts, you will have to determine the morality of that, and the justice of that,” he contended. “I think that when we talk about morality, what we are talking about is all of God’s children. 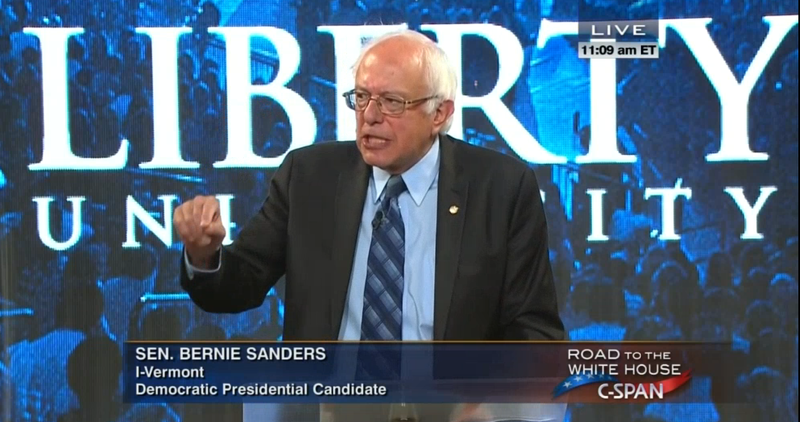 The poor, the wretched—they have a right to go to a doctor when they are sick,” Sanders posited. In an interview following the event, Sanders told reporters that he believes morality involves more than abortion and homosexuality. Falwell also stated that while he realizes Sanders is a socialist and disagrees with his socialist views, he believes Liberty University still has beliefs in common with him. “We have the same goals—helping people in need—we just have different philosophies on how to get there,” he said. Falwell said that Hillary Clinton and Donald Trump have likewise been invited to speak. The university has a long history of speakers that have raised concerns, including Mormons Glenn Beck and Mitt Romney (the former of which cited LDS doctrine on stage), Roman Catholics Newt Gingrich and Jeb Bush, and others. Students were split on their reception of the Democratic candidate, with some cheering and others not so enthusiastic.